Where did the month of April go? It vanished in a blink. Oh, yeah, I was sick with a cold for half of the month. The other half was spent taking care of the little ginger and Mr. Ginger with the same cold. I welcome a new month! So, I thought nothing had been accomplished in April, but alas, the pictures on my SD card prove otherwise. I did finish piecing the Gypsy Wife top. What a masterpiece! I have danced before over a complete quilt top, and I certainly danced a happy dance over this one. I also quilted a number of tops for some lovely customers. The first top was made by my sister-in-law, Cheryl. This is her first quilt! I quilted this stunner with my new favorite all-over pattern, free-motion feathered paisley. Cheryl was bit hard by the quilty bug (maybe I had something to do with that! 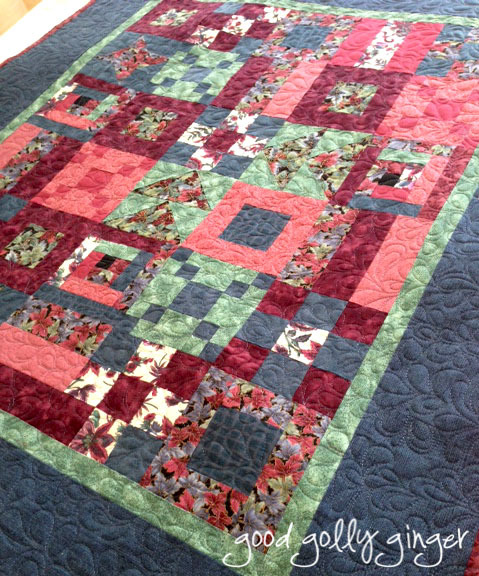 )...She pieced this beauty, and I quilted it with a free-motion, all-over flowing water pattern. I also quilted THREE stunning quilts for Kay. The first one is a perfect quilt for a garden party. I love this pattern with the x's and o's and the hidden stars. Kay had a special request for this quilt. 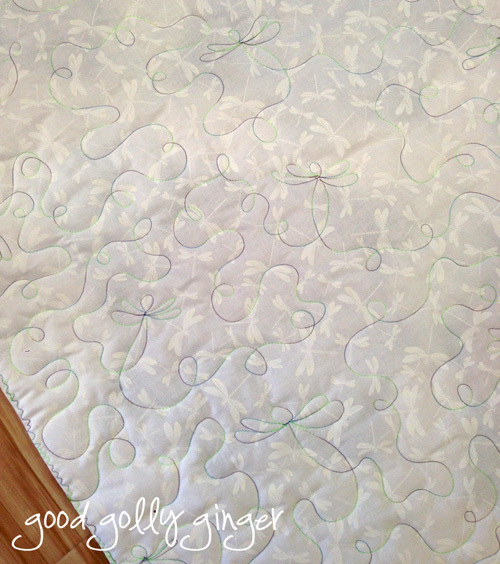 She wanted to echo the dragonfly pattern of the border fabric in the quilting. I came up with this free-motion, all-over dragonfly and loop pattern with the help of pinterest. I was so thrilled that I could achieve Kay's request. Someone is surely going to love cuddling with this happy quilt. Kay also brought this beautiful quilt to me. I have an affinity for butterflies, and the fabric used here is iridescent. 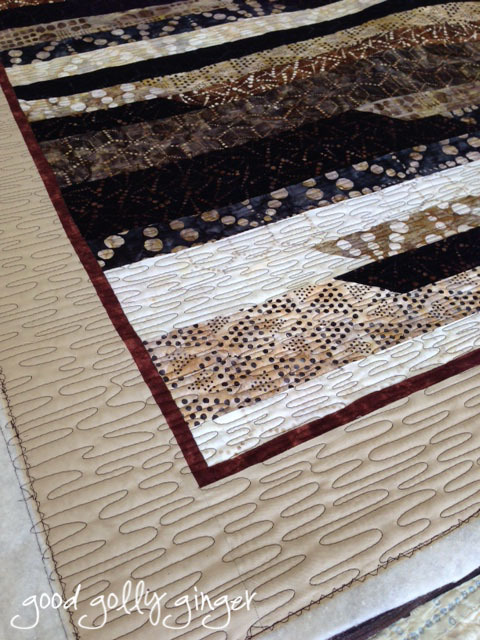 We chose to quilt this one in a free-motion, all-over wispy swirl pattern with gold thread. I love it! And finally, Kay had this sweet over-sized fairy baby quilt for me. I quilted this delight with free-motion all-over loops and hearts. With purple minky for the quilt backing, some lucky girl is going to sleep with some heavenly fairy dreams very soon. So, the month of April was not a complete bust. I had a lot more finishes than I realized. I was also very pleased to be able to get rest when sick, and take care of the sickies when needed. I think that's the balance we all strive for. On Friday, I will be participating in Lori Holt and the Fat Quarter Shop's blog hop, Farm Girl Vintage. I am so excited. Do you see the Jen Kingwell Gardenvale charm pack? You can pick up your Farm Girl Vintage pattern book at the Fat Quarter Shop. 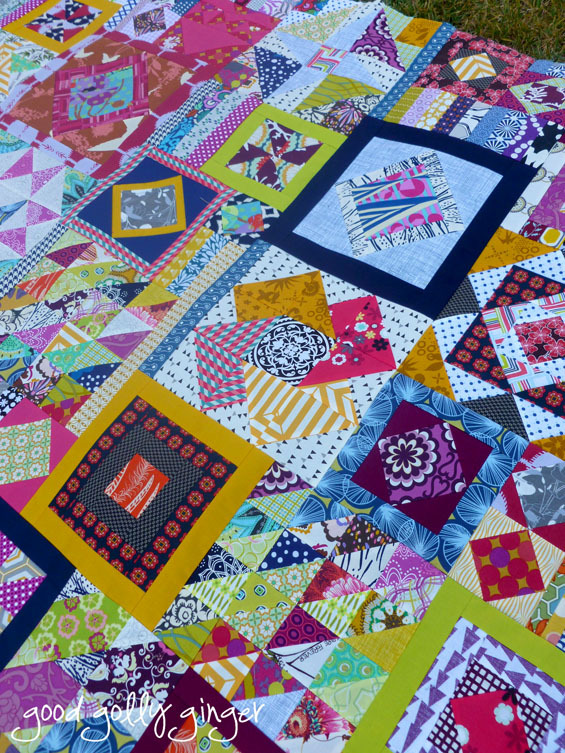 Last year, I made the quilt in the picture below during the Quilty Fun Sew-Along. It was so much fun! I urge you to join this year! 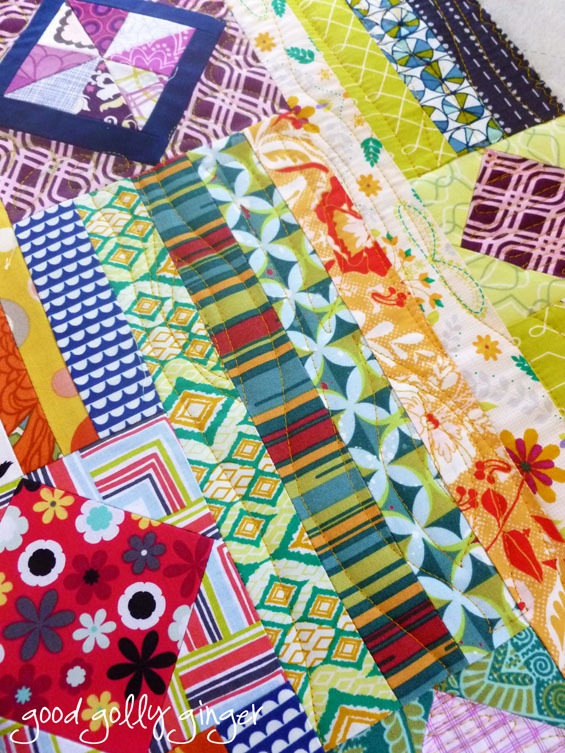 Lastly, I am busy quilting the Gypsy Wife top... See you on Wednesday for the SMS Giveaway Day! 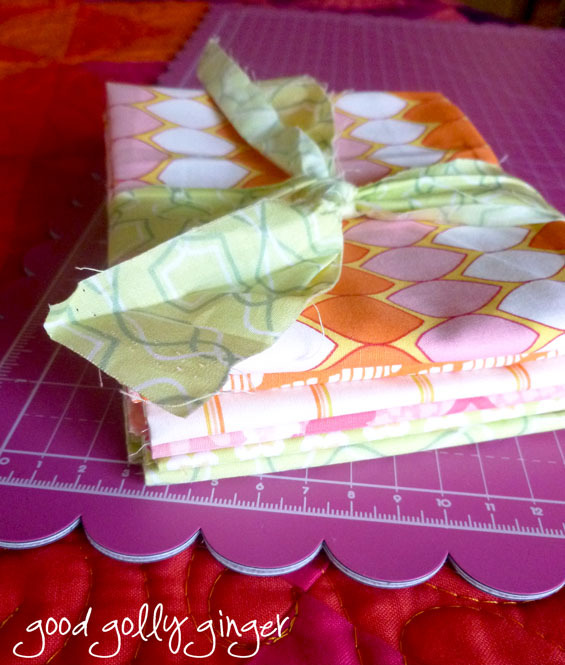 Until then, have fun quilting! I hope you and the family stay healthy for a bit and have a lovely May. I would definitely celebrate over the gypsy wife quilt completion - that is a huge accomplishment. 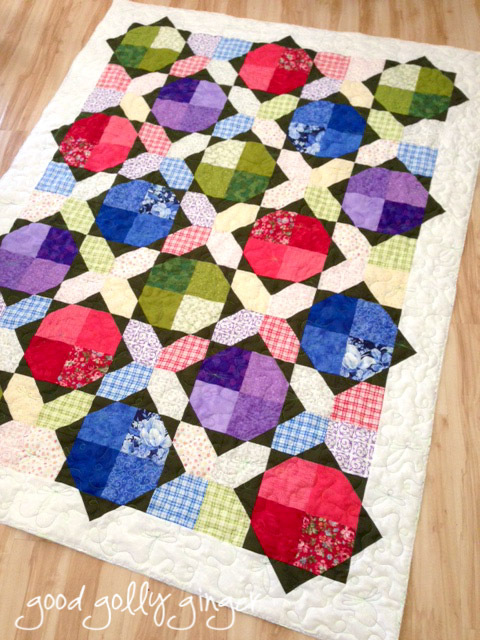 As is passing on the quilting bug to your sister-in-law; awesome! So many beautiful fabrics to spot in your gorgeous Gypsy Wife! Well done, and welcome to a new month!!!! Congrats on your Gypsy Wife quilt.... It is truly gorgeous and I love it. Deserves more than just a little dance, possibly some chocolate and a good bottle of red to celebrate! 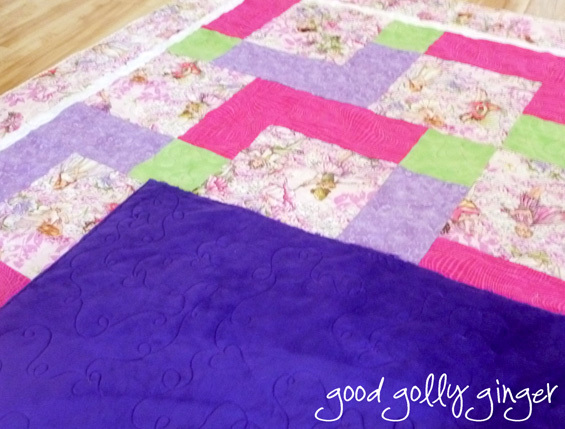 Your Gypsy Wife quilt is beautiful! You deserve a party for that finish!! Katie - I love your Gypsy Wife top - the colors are awesome. And all of your quilting is fabulous. Glad you're over your colds now. Enjoy May! 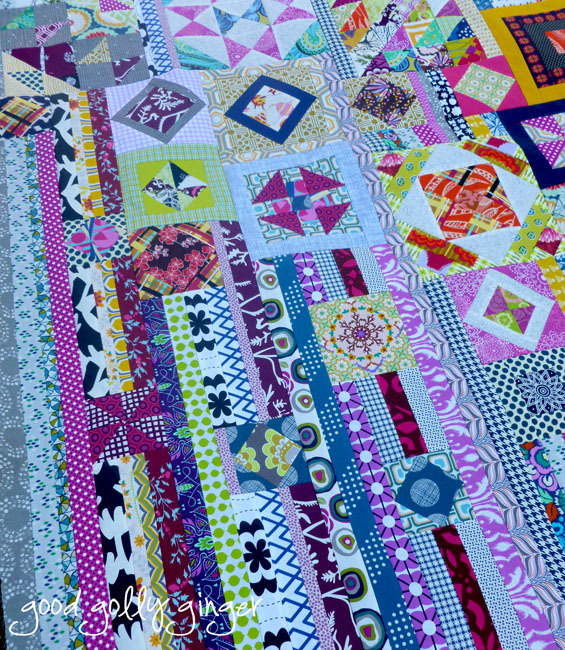 Oh I love that Gypsy Wife quilt top. The fabrics you've used are beautiful. I know it's a complex design, so well done on getting it finished. Congratulations on finishing your GW... it's beautiful! I too have made this and it certainly was a great feeling to actually finish the top! And I really love your colour combo, very gypsy-ish! Love your gypsy wife!!! It turned out so gorgeous. So love the fabrics you picked for your Gypsy Wife! It's stunning, bright, and fresh. Glad you're over that sickness - my daughter had it for 3 weeks. Your quilt is gorgeous! Your quilt is BEAUTIFUL, congratulation on s tremendous finish. Wow you have been super busy!! That Gypsy Wife is so visually stimulating! 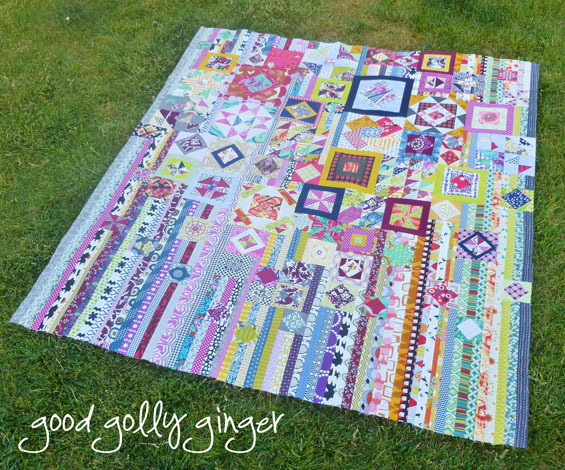 The Gypsy wife quilt is definitely something to celebrate!! 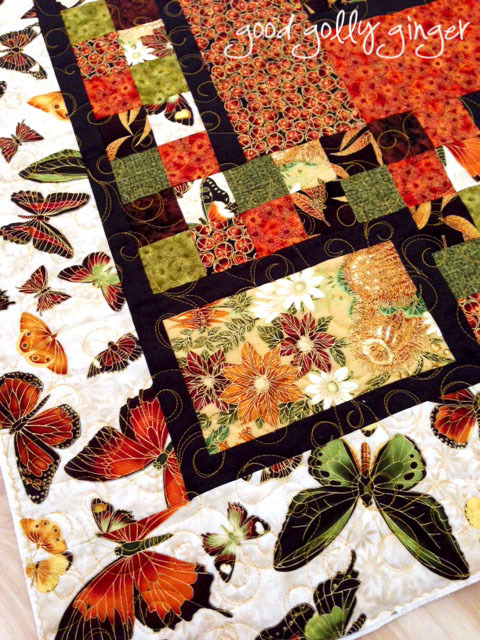 And your other quilting projects are just beautiful--I especially like the dragonfly quilting. It looks like April was a very successful month for you! you definitely did a lot in such a short month! heehee - it's that missing day that makes april seem so short, right? and your gypsy wife finish is something to dance a lot over! mine is still plodding along, slowly but surely. i don't think i've seen one with so much purple in it yet, which really makes yours stand out. 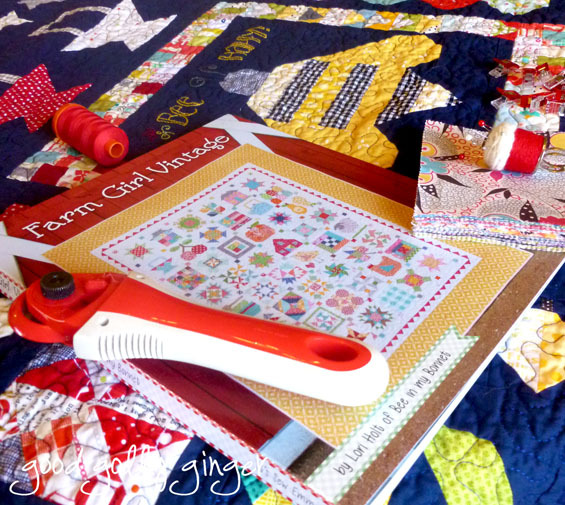 have fun with the quilting! You got a lot done last month. The Gypsy Wife is gorgeous and I'm totally in love with that butterfly bordered quilt.